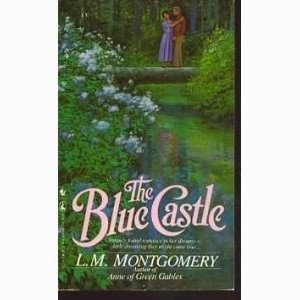 Like many of you, I found it remarkably easy to fly through the reading of The Blue Castle , by Lucy Maud Montgomery. This is not my first reading of the book, nor will it be my last, although I would dare to say that my opinion of it has changed with a little more life experience under my belt. The Blue Castle is one of only two titles which Montgomery wrote for an adult audience. (The other being A Tangled Web .) It is also notable because it is the only title of Montgomery's which is set entirely off of Prince Edward Island. These two factors are the reason why I chose this title, specifically, for the Reading to Know Book Club for the month of January. The world is very familiar with Anne and Prince Edward Island but not so much with The Blue Castle which I have always found to be a fascinating story. This book tells the story of Valancy Sterling who we meet on her 29th birthday. She is alone and lonely, despite the fact that she lives with her mother and an older cousin. Valancy has been "kept down" by her mother, living a dull life with countless legalistic rules imposed upon her. For one thing, she isn't allowed to read for pleasure (a fact which will make readers recoil in horror) and definitely never on Sunday. She is kept in simple, ugly clothes, made to knit incessantly (even though she hates it) and is brought up to believe that any girl is better than she. She feels unloved by her mother and does not love her mother in return. When she wakes up on the morning of her 29th birthday she finds herself depressed with life, for nothing in her world ever changes and she has nothing to look forward to. She is a creature to be pitied, that is for sure! Valancy also suffers from a heart problem which she doesn't understand. She doesn't want to tell her relatives about it and be taken to the family doctor only to have everyone fussing over her even more than they already do. She makes up her mind to go see a different doctor than the one her family usually sees. This doctor examines her heart and informs her that she has a fatal condition and, at most, a year left to live. Valancy is devastated. She can't bear the thought of not having truly lived in life. Determined to have "her hour" and enjoy a wee bit of life, she makes the decision to begin defying her family's expectations for her. She begins speaking her honest thoughts and dares to do things that her family would rather her not. The Sterling family believe that Valancy has lost her mind (for real) but Valancy is merely having the time of her life. I don't want to offer any spoilers, so I'll leave it at that. I've always liked this book and connected to Valancy because she finally dared to do something different and unexpected with her life. Now, I don't want to make any of my growing up years sound awful because I don't in any way believe that they were. However, I would say that life was fairly predictable for me. Then, one day, I decided to move far away from home (which is something that none of my friends, save one, had really done). And I wasn't leaving home because I was getting married (also a bit different in my social circle) but because I wanted some adventure. When I read Valancy I can see myself in her, wanting to shake things up and try something new "just because". We differ though in that she resented her mother and relatives for her upbringing and I do not resent mine in the least. My family were always loving and supportive. So off I went, due west, and I have loved the result of my own personal leap of faith in striking out to see what I could see. For this, I identify with Valancy and love this book. However, during this particular reading I have to say that I liked Valancy less than I had previously. When she left home, she really rejected who she had been growing up. She shows no love in thought, word or deed to her mother. Now, grant it, her mother was strict with her and forced her to live according to legalistic rules, telling Valancy that God was a God of wrath and wrath only. Valancy rejects family and faith as a result (which is to be expected from a human perspective). However, I find Valancy somewhat appalling in that she had no grace and forgiveness to offer to her mother, even though she spent her whole life craving it. - The town of Deerwood in this book is based on the town of Bala, Ontario. Montgomery visited this town in 1922 and it was in this town that she was inspired to write The Blue Castle. - The book was published in 1926. - Bala's Museum is open to visitors. It is the home where Montgomery dined during her stay in the area. I browsed the museum's website a bit and watched a video about it which is at the bottom of this page. The video is interesting in that it tells you about the museum but it also features Lucy Maud Montgomery's actual granddaughter, Luella (the only one she knew in life). 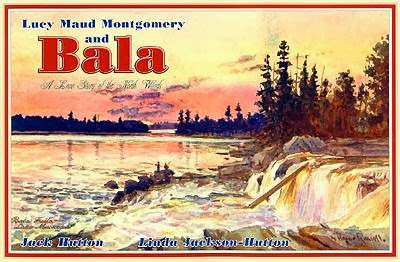 - The owners of the museum wrote a book entitled Lucy Maud Montgomery and Bala : A Love Story of the North Woods . If I ever get a chance to visit (I hope so!) I shall pick up a copy. - The Blue Castle has not (yet?) been made into a movie but it has been made into a musical by Hank Stinson. - A bit of Carrie trivia . . . many years ago I was starting a photography business and trying to come up with a name that didn't scream, "I LIKE ANNE OF GREEN GABLES!!!" to the entire world. Every so often I'm asked what is the inspiration for the name. Can you now guess? I hope you are enjoying this Lucy Maud Montgomery Reading Challenge. If you haven't had a chance to get into The Blue Castle yet, don't fret (and don't dawdle)! It's a remarkably quick and easy read and if you have not yet read this particular title, I highly recommend it to you and hope you'll give it a chance. While I have read how quick and easy The Blue Castle is I must be honest and admit that I am struggling with it. Oh, I'll manage through. I feel intensely sorry for Valancy but then I dislike her for the wretched thoughts she has. I suppose it comes from the book being completely different than what I expected. I expected something along the lines of Anne. With Anne there is nothing but love. Valancy.....love/dislike, love/dislike. I'll come back and read this after I finish the book. :-) I'm only a couple of chapters in and it is a little depressing so far, but I am hoping things will turn to some degree here soon. It's very interesting to read others' thoughts about Valancy. Montgomery hooked me right off with her commentary on being 29 and single at a family party. There were plenty of things I didn't identify with Valancy about, but being "old" and single was one that I definitely did identify with. What you're saying about Valancy's unforgiveness is true, although I didn't really take much note of it as I read. I suppose I had enough immediate liking to let me pass over her obvious faults. I loved the Blue Castle. I think LMM is now my favorite author! In 1989/1990 I was living with my cousin and his family in Maryland. They had Anne of Avonlea on VHS and Beta (!) Of course, I immediately loved it. I didn't know that it's out now on DVD. I know my girls will love it too. You know, I had some of those same thoughts as I read it. On one hand, I like that she let go of what was holding her down and started being bolder and not so worried about pleasing everyone, but underneath it just seemed there was this little current of resentment that she never let's go. And I get that, but it left a funny taste in my mouth. Thanks for choosing The Blue Castle for January's read!! Reading all the comments makes me want to re-read thud one! Too many books, too little time. I liked the second half much better than the first half. I wonder if L.M.M. struggled with unforgiveness? It seems to be a reoccurring theme throughout her writings. I don't know if Valency could even know what forgiveness was or how to give it considering the family she came from. On the other hand it could just be what makes L.M.M. writing really stand out. That strong tension that always seems to hang about in her stories and give it that edge.